It was 36 years ago today that we started our lives as missionaries. We remember so well that day when we got on an airplane in Miami to fly to San Jose, Costa Rica. Wow, January 1982. We could never have imagined all the amazing things that have happened because we stepped out in faith to go and do what we felt God had put in our hearts. Living in Costa Rica, Russia and now here Hungary since 1997 it’s been an amazing “ride.” We have loved it all and still love doing what we do! So many people gave us little chance as missionaries. Others said we were not qualified and I remember someone telling me even after being missionaries a few years that, “we had no business being missionaries.” But God quite often uses the most unlikely people. In the natural maybe these people were right. We probably really weren’t qualified as missionaries, but God saw something many people couldn’t. Now here we are THIRTY-SIX YEARS LATER still serving and loving what we do. And we are still excited about what God has for us this year, 2018! Our Plans For 2018 – To Help Start Another 10 Churches! Can You or Your Church Help Us Do This? We will invest about $4,000 in each of these new churches. We work with key national leaders in each country to start these churches. Each of these new churches is pastored by a national who speaks the language and knows the culture. The money we invest is enough to help for the first twelve to twenty-four months. By then the Pastor has taught his people to begin to support the new church. We primarily help to start the churches in towns that do not have an active evangelical church in them. In the past EIGHTEEN years we have helped key national leaders start more than 275 churches. Churches that are now making an impact upon their cities. You have helped us do this! This year we will see at least 10 more started. 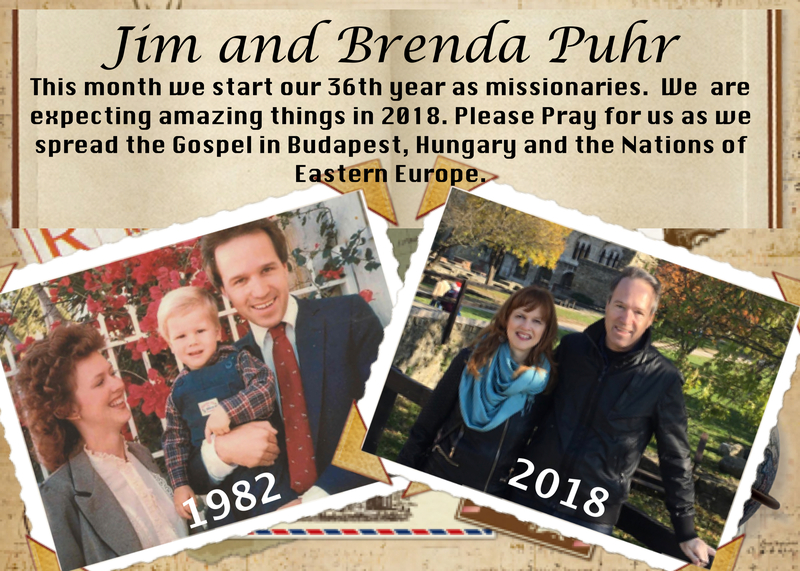 As we begin our 36th year as missionaries, we are amazed that we get to do what we do and absolutely love being missionaries in Hungary. PS. As you make your plans for this new year, prayerfully consider whether the Lord would have you stand with us here in a greater way. Possibly you or your church can help sponsor a new church.